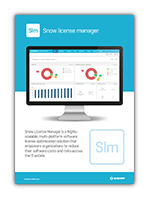 Snow Software is a leading provider of Software Asset Management (SAM) solutions. Designed to help stop organisations paying too much for the software and cloud services they consume, Snow supports over 4,500 global organisations save money, remain compliant, and regain control of their software Headquartered in Stockholm, Sweden, with European headquarters in Bracknell, UK, Snow’s on-premise and cloud-based SAM solutions manage software licensing across more than 11 million devices, from mobile to desktop, datacentre to the cloud. Trustmarque has a well-established partnership with Snow, offering exceptional Software Asset Management services to our customers across both private and public sectors. Our software services are unpinned by Snow technology, as we know it provides a high quality, reliable and, above all, value for money Software Asset Management solution. We focus on helping our customers fully utilise their IT assets by helping them better manage compliance, security and costs to deliver real benefits to their organisation. Our expertise in Software Services, Full Managed Services and Cloud Solutions makes for a perfect relationship with Snow. Our specialist Snow certified professionals are on hand to work with teams to ensure that we deploy the right Snow SAM solutions for your environment that best meets organisation needs; ensuring lower licensing costs, improved security and minimised risk. Snow Software was named a leader in the Magic Quadrant, positioned furthest to the right for completeness in vision and highest for the ability to execute. This Magic Quadrant evaluates six vendors to help you find the most suitable one for your organization’s needs and deliver greater business value. 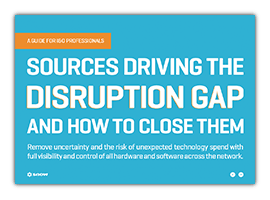 Download Gartner’s Magic Quadrant report to find out how Snow competes with other vendors. 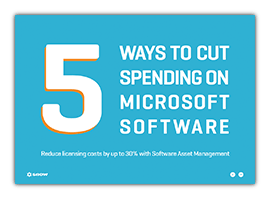 Can you cut your spending on Microsoft Software?